Oh, man. This is just an all-around winner. 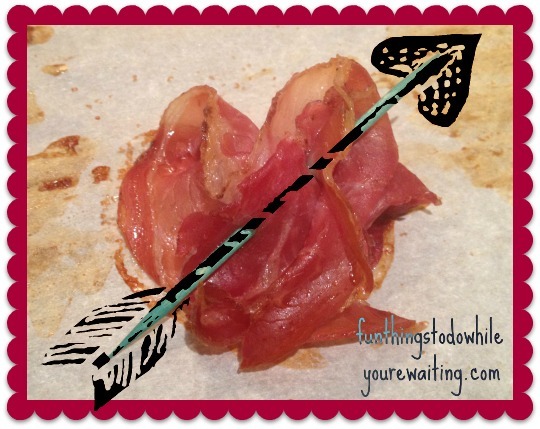 The post teaches you how to roast prosciutto to create crispy strips of awesome. If you aren’t familiar with it, prosciutto is just thinly-sliced, dry-cured ham. It comes in all different types of cut-thickness and varietals by region or by pig type… but regardless of the factors that went into making it, it is delicious (assuming you like meat- my apologies to those who do not). The directions for roasting are dead simple. Parchment paper on a cookie sheet. Prosciutto slices evenly distributed in single layer. Oven at 350. 10 minutes. Remove to baking racks to cool. The only problem I’ve had with this technique is actually having prosciutto on hand to make these chips. As prosciutto, by its very nature, is so delicious AS IS, it often ends up disappearing in my household before I can put it in the oven. However, let me tell you, that when I DID roast it, it adds a whole other layer of deliciousness. The roasting enhances the flavor and renders some of the fat from it. The rest of the fat, however, is absorbed into the chip! Total win. You will want to watch them roast starting around minute 8 as the window between crisp and burnt is small. Though the one time I did overcook them, I just wound up crumbling them and using them as a garnish for salads. So, even when they are overcooked, it is still a super win. And, on a side note, if you are into the meat arts, prosciutto is very malleable. For Valentines Day this year, I made Jojo a tray of prosciutto hearts. Homemade Whole Wheat Tortilla Chips Tortilla Life Hack Quinoa Breakfast Bowl: A Gut Buster… in the BEST Way!